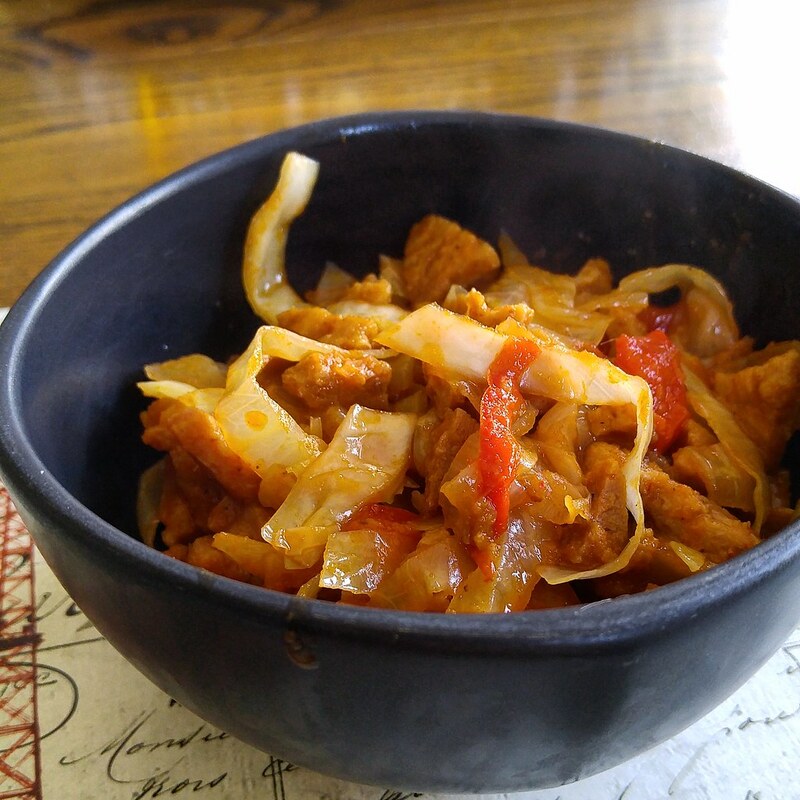 Cabbage and Pepper Thai Curry | What Smells So Good? 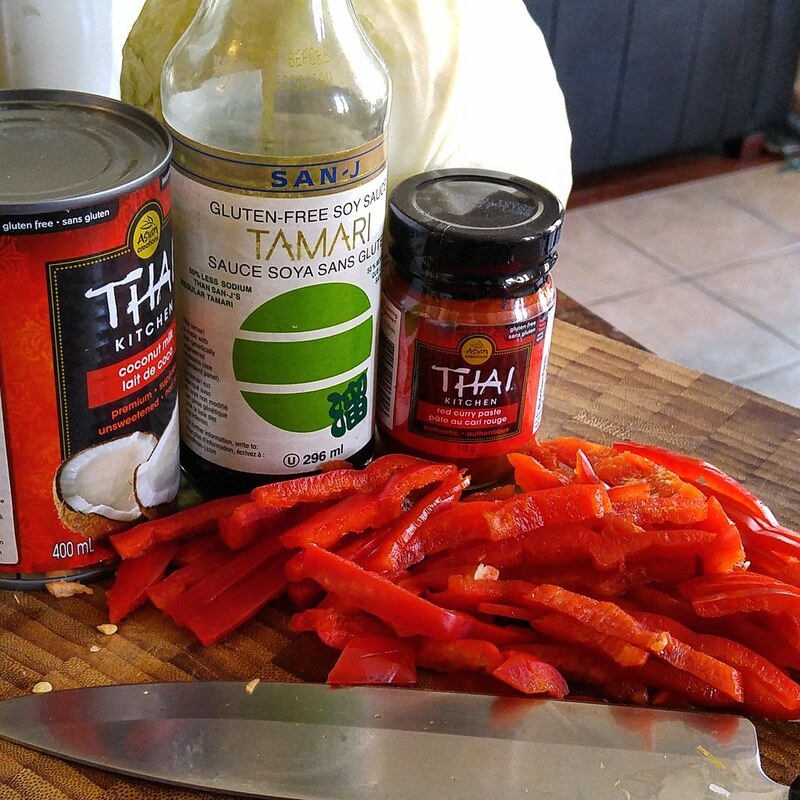 This gluten free, vegan red Thai curry is packed with veggies and soy protein, all flavoured to the hilt with coconut milk, garlic, ginger and red curry paste. I'm going to preface this with a "wow, it's been a long time since I've posted". I keep meaning to, really, but as we all know that thing called life gets in the way all too often. This time of the year is always packed for us teachers, between report cards, trips, tournaments and plays, and with a new semester of university upon me the workload is just as high. On a serious note, my health has (again) been up and down so days when I could be writing, editing photos, etc I was sleeping or watching TV with glazed-over eyes. If I haven't mentioned it before on here, I've been diagnosed with rheumatoid arthritis, which affects both my joints (especially those in my feet and shoulders) but the connective tissues and digestive system. As a result, my legs and feet swell up like balloons and I threw out both my shoulders in a period of 3 weeks - one time putting on a coat, the second warming up in a gym class. I can take solace in the fact that this autoimmune condition is likely the cause of all my stomach and digestive issues, and my skin definitely responds well to a gluten free, mostly vegan diet (I have fish on occasion), so I'm not simply one of the freaks of nature. Well, I am, but now I'm an explainable freak! The drug trials I'm on do take their toll on my energy though - they're immunosuppressants so I do get sick more easily and have to watch myself, especially around the kids. Lots of handwashing! I do have to thank my lucky stars that (at least for now) the Ontario government has a program in place to cover the absurd cost of the medication, because otherwise I would be 120% out of luck! One thing I haven't stopped doing, though, is getting into the kitchen any chance I can. Not only have I spent the last few weeks pulling Medieval and Egyptian recipes for two of our school plays, but I decided to take on a version of "The Grey Stuff" from Beauty and The Beast for the third play as well. As with last year, making recipes for school events is never a small feat - often it means scaling things up 3-4 times (in the case of "The Grey Stuff" we had to make enough for 120 people!). I'm in the process of purchasing ingredients and within a few weeks you should be seeing some Instagram posts on the subject, so stay tuned. At home, weekly lunch prep for Mom continues, and knowing her penchant for Thai style food I knew it was time to make her another curry. I was inspired by a recipe for dumpling filling found on Healthy Nibbles and Bits and decided that rather than mess around with trying to beautifully fold a billion dumplings, I would toss the curry over rice and call it a day. We love our veggies here, and with cabbage being perpetually cheap and common, not to mention a great bulking agent, It was a perfect choice. Being a red curry, I capitalized on colour and used red bell peppers as well. For protein, I used TVP, one of our staples here since it is so versatile. Everything came together quite quickly and (as with most curries) tasted better the day after. Even reheated from frozen, my mom declared that it was definitely on the hit list - and it must have been since I've made it three times already! I used tamari since its what I had, but if you don't have gluten issues use standard soy sauce. Don't skip on the veggie sautee time either, and definitely use a big pot - that cabbage is bulky before it cooks down! In a large bowl, combine TVP, broth, garlic powder and ground ginger. Set aside for 1 hour. If using tofu, toss with garlic and ginger powder and set aside. Heat oil in a large pot over medium heat and add the onion, ginger and garlic. Cook for 7-8 minutes, until the onions soften. Add the cabbage and bell pepper and cook, stirring, for 10 minutes. Add the TVP mixture (or tofu), red curry paste, coconut milk, and tamari, stirring well. Cover and cook 15 minutes on low.